Adhesive ply bonding's ability to create a more durable bond than mechanical ply bonding minimizes potential system downtime and enhances end-use performance. American Custom Converting (ACC) specializes in adhesive ply bonding as part of its service line for converting papers and nonwovens. Conventional ply bonding features a matched set of rollers that mechanically forces two webs together, while adhesive ply bonding uses adhesive applied strategically in narrow strips toward the edge of a substrate and then marrying it to another layer of the same substrate. The result is a strengthened combination with properties ranging from protection to performance. "Some converting processes, such as two-ply napkin stock, will cause machine difficulties if those two webs are not bonded," says Mark Kyles, managing member of sales. "Adhesive ply bonding can be as much about getting product through the converting process as it is adding value to the finished product." One of the advantages of adhesive ply bonding is the ability for converters to create a heavier grade and stronger material by doubling up on the thickness. The resulting material has a softer feel with the limited use of adhesive compared to laminating all the way across the substrate. Facial tissue is a common consumer product that uses an adhesive ply bonding process. "Substrates laminated to like substrates provide added bulk and machine capabilities," Kyles says. "In some converting operations, the sheets will slide and cause backups within the machine if they aren't bonded together." ACC has experience with a variety of tissue weights ranging from as little as 9- and 10-pound basis up to 20- and 22-pound basis. The company's wide web capabilities can handle widths up to 108 inches for water-based adhesives and 122 inches for hot melt applications. Its large roll unwinding capabilities reach 89 inches outside diameter or 6,000 pounds, with rewind at 59 inches OD. 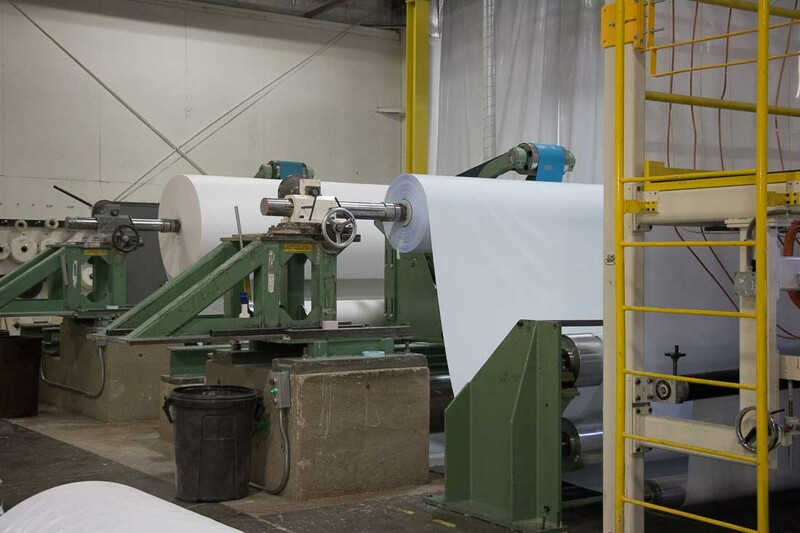 American Custom Converting is a Green Bay, Wisconsin-based converter of paper, tissue, nonwovens and other substrates, as well as a provider of hot and cold lamination services, folding and packaging, aqueous coating, complete product finishing and contract manufacturing. ACC teams adhere to Current Good Manufacturing Practices (CGMPs), supported by a dedicated Quality Assurance Manager, and are dedicated to adding value with integrity for every customer. View original article on adhesive ply bonding here.